This site provides a comprehensive discography for the recorded works of Ferrante & Teicher. It was created on October 1, 2013 and remains a work in progress. Ferrante & Teicher's manager, Scott W. Smith, created a chronological list of each "original" album with its year, label and catalog number. Using that as a base, I've expanded it to include track listings, cover photos, credits and liner notes. I've also added some publicity photos and other press materials. Many thanks to fans Chris Locke and Marvin Black for filling gaps in the album pages! If you have corrections or additions, or if you simply find these pages a useful reference, please let me know. 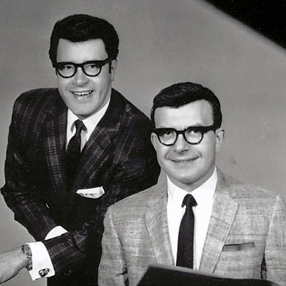 Information about Arthur Ferrante (September 7, 1921 – September 19, 2009) and Louis Teicher (August 24, 1924 – August 3, 2008) can be found in the liner notes for many of their albums, including 40th Anniversary, Heavenly Sounds In Hi-Fi, Ferrante & Teicher With Percussion, and The Sound Of Music. My musical interests lie mainly with Billboard Top 40 hits from the 1950s through the 1980s. In the late 1970s, I became fascinated with the big-band sound of Ray Conniff's early instrumental records. As the quadraphonic format was dying in the mid-1970s, my father purchased a Channel Master quad system. Among the handful of 8-tracks he purchased was Ferrante & Teicher's "quadrasonic" Killing Me Softly with four discrete channels. I loved that tape! Other than Beautiful... Beautiful (on stereo 8-track), I never heard another F&T album until I entered college nearly a decade later. I met Richard Stallman in 1984 and learned of his newly launched GNU Project. He was a panel participant at Wang Institute's Distinguished Lecturer Series representing very unusual, and controversial, ideas regarding the problems of software piracy and licensing. He thought everything should be free; I thought he was nuts. The only cost for this site – besides my time – is for hosting. However, thanks to cloud computing, I don't have to pay much.